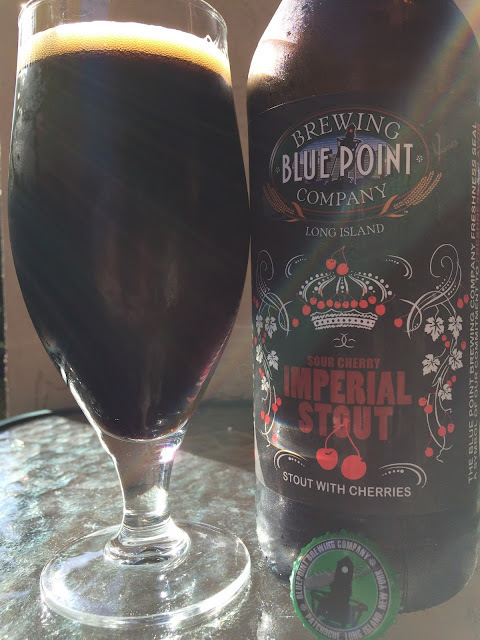 A few weeks ago, I had the opportunity to meet Blue Point Brewing President Mark Hegedus over a few beers and some tasty seafood. 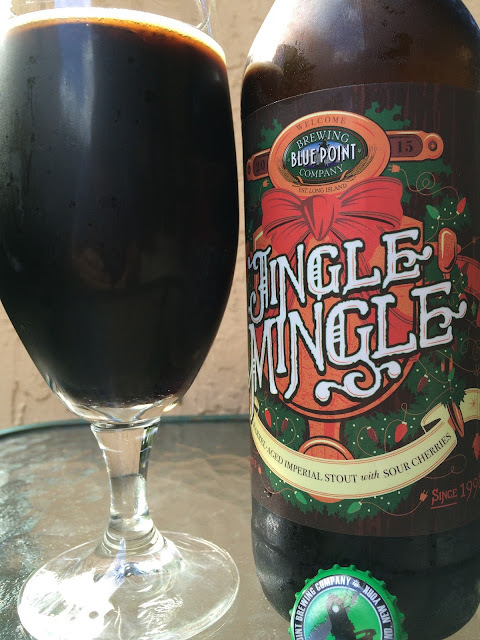 One of the beers we tried was their Sour Cherry Imperial Stout, and while we were enjoying that, our conversation turned to the barrel aged version of that beer, known as Jingle Mingle. Jingle Mingle is a limited release version of that sour cherry imperial stout and is aged for one year in Heaven Hill Bourbon Barrels. This beer is Blue Point's first jump into barrel aging, but considering Mark's history with prolific barrel expert Goose Island, this seemed like a perfect introduction. Heck, Mark told me Goose even supplied the bourbon barrels they used, trading them for some kegs! I'm drinking both beers again right now, side-by-side. My wife was helping with the two bombers but I guess I'm going to need to do these alone. 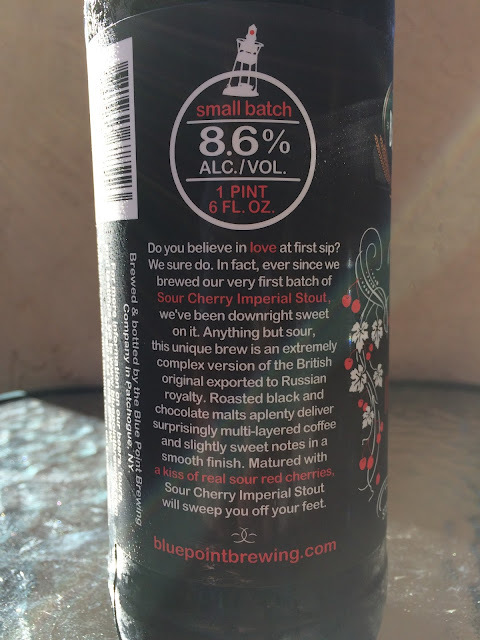 The original Sour Cherry Imperial Stout is an 8.6% alcohol beer brewed with a kiss of sour cherries that will sweep you off your feet. Nice rich, sweet cocoa aroma with a very pleasing cherry streak. Flavors start with some rich chocolate and cocoa powder. The tart cherries come next and stand out all the way through to the finish. Dark fruity flavors including prunes and raisins add interesting nuances. Rum cake, light char come to mind. Very nice expression of a Russian Imperial Stout! Jingle Mingle looks the same as its non-barrel-aged brother. The aroma is again full of strong chocolate, very rich. 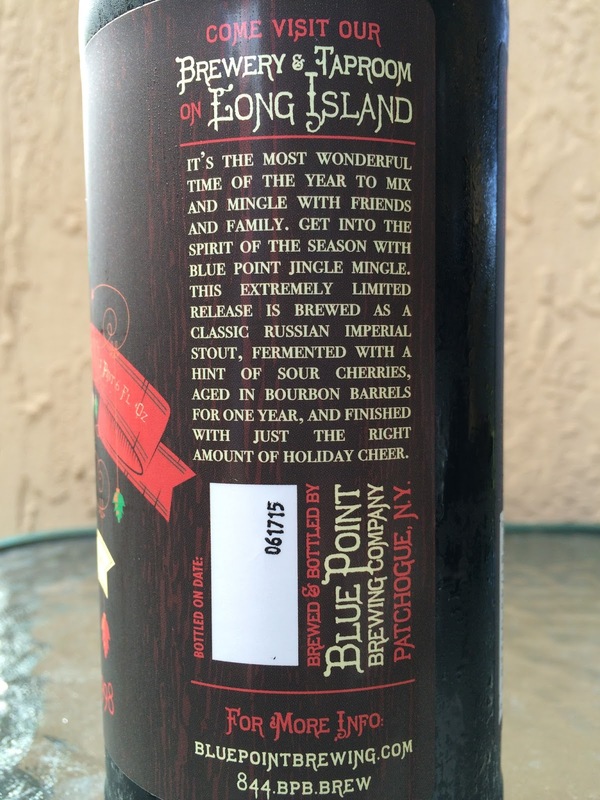 Cherries are less prominent on the nose with maybe just a hint of bourbon sweetness. Rich chocolate flavor with a big body. Unlike the aroma, though, the cherries really pop and play nicely with the bourbon, alternating sweet and tart. While the bourbon is noticeable flavor-wise, it's more an enhancer of the cherries, chocolate and pruney nuances. Oh, and also way more boozy at 11.4% alcohol, though not hot or "overly alcy". Anyway, I like the both versions. And both pair well with Mario Kart 8's Rainbow Road!